No phone launch is complete without a few accessories added to the mix. Samsung had a whole bunch to announce alongside its Galaxy S 4, but only a few were on hand to check out up close and personal. We did, however, find a nice surprise hiding under those glossy white table covers — a wireless charging pad. 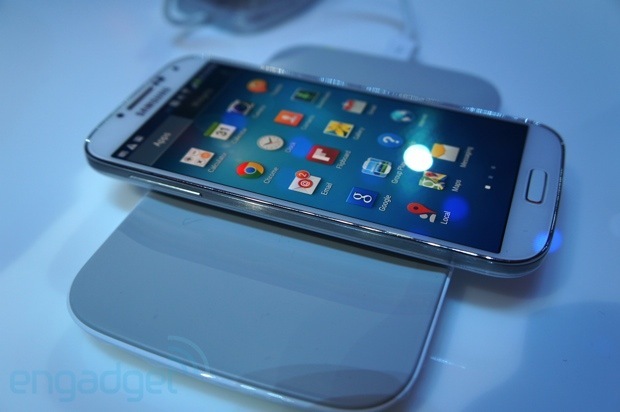 Yes, it turns out the the GS 4 does in fact have Qi wireless charging capabilities. Provided its available in your region and your carrier chooses to support it. The charging pad itself has a glossy plastic base that matches the phone, but there’s a nice rubbery gray top that keeps the handset from sliding around too much while it’s juicing up. We also got to check out the companion wireless scale that looks quite a bit like the Fitbit Aria. Though, with a square LCD and a healthy-sized Samsung logo on it. The scale is just one part of the larger S Health equation which also includes a Jawbone Up-like monitor (S Band), which was sadly nowhere to be found in the demo pit. The scale of course sync with the baked in S Health app over Bluetooth, which makes it quite a bit easier to track how that diet of yours is going. In addition to simply tracking your total poundage, there will be bands for tracking heart rate and the S 4’s various sensor can help judge the comfort level of your environment. It’s very helpful for me ,is this pad can working with charging accessories like this article descriped ?